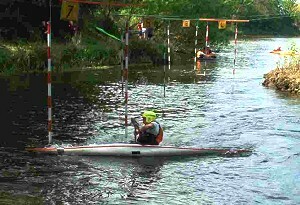 The slalom course is on the River Don, in a large city park, less than 10 minutes from the centre of Aberdeen. The start of the course is a large pool above an old weir, and it then follows the channel down the near side of the island behind the weir. It offers fairly flat moving water with a few interesting eddies and flow patterns - ideal for beginners, yet still interesting for Division 3 and a good training base for higher division paddlers. This was one of the earliest permanent slalom training courses in the UK, established by University paddlers during the 1970s. It has been home to an annual introductory (Novice/Div 4) ranked slalom since 1978. Seaton was the home training centre for the Scottish Slalom squads of the late 1970s, prior to the acquisition of Grandtully. The park is an oasis for wildlife, with formal gardens, open parkland, a football training area used by amateurs and for summer football festivals and an attractive children’s play area. A large public car park is situated next to the play area, with controlled access for unloading by the slalom site. Public toilets are adjacent, but there is no camping and caravanning permitted in the park, although there are a number of sites near Aberdeen. Recent work by the City Council has provided wheelchair access to the course. Enter Seaton Park from Don Street, off King Street (highlighted at A). If travelling from the North this a right turn at the second traffic lights after crossing the Bridge of Don. From the South it is a left turn at the first traffic lights after the roundabout at the junction of King Street and St Machars Drive (by the University). After about 200 metres there is the public car park to the left and a barrier, which on competition days will be unlocked for access.